The earth is but one among countless other earths across alternate dimensions. It and every single atom on it will be annihilated... unless its human representatives compete and win in a battle tournament on a universal scale. Victory means a chance to enjoy another few days, weeks, or months of existence. Defeat? Oblivion. Bokurano is not a happy manga. You might want to go read Kare Kano if you're looking for something more lighthearted. I have to admit, after finishing reading Bokurano (which translates to "Ours" in English), I felt profoundly depressed. Many of the startling revelations, ambitions, actions, and scenarios reflect what really happens in real life. Granted, the perspective leans more towards pessimism and tragedy, but that doesn't make some of the things that happens in the manga any less possible. One thing you have to keep in mind while reading is it's not about the mechs; not totally, anyway. 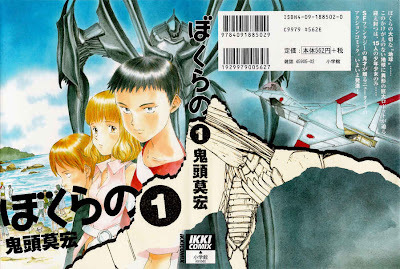 Bokurano - translated as "Ours" - is primarily a character-driven manga. You read it to get into the minds of the pilots who fight to save their world. In fact, each chapter in Bokurano is done from the point of view of a different, unique pilot, and no pilot's POV is repeated. The title, then, fits perfectly. The characters, their perspectives, their actions/beliefs/reasons for fighting, the world that they seek to protect - all of it, is "ours." I'm trying hard not to spoil anything major here, and if I keep writing about it I fear I might let something leak. However, please, do not read this if you are at a very high point in your life. Likewise, do not read this if you're already prone to depression. Keep away if you're planning on doing charity work anytime soon, or if you already do. The only time I would possibly advise this manga be read by anyone is if they feel mentally, emotionally, and maybe even spiritually prepared to come face-to-face with one author's raw take on the naked truth of humanity and what we live for.